Many makes and models of blenders offer a variety of features and uses, depending on which brand you purchase. Standard blenders may work well initially, but many are unable to handle high-power processing on a variety of food textures. Some parts can wear down or burn out, and others may be difficult to disassemble and clean. Investing in a good quality blender will guarantee durability, consistency in high performance, and therefore quality results. Purchasing a good quality blender can be daunting with so many choices available. That’s why we are going to break down the task and look at some solutions. In this review on Wolf Blender vs. Vitamix, we will show you how you can replace as many as six household gadgets in one purchase. The Wolf blender and Vitamix brands are among the top choice in high-powered blenders on the market. We will show you the similarities as well as the differences in both machines. Wolf Blender vs. Vitamix is mostly a matter of personal preference. Your lifestyle choices and how often you use the blender will influence your decision. Since food preparation is key in consumption quality, the survey of the vitamix and wolf blenders will give you better options for prepping and processing whole fruits and vegetables to maximize their nutritional benefits. You can process soups, purees, sauces, beverages, and batters for a more wholesome eating experience with friends and family. 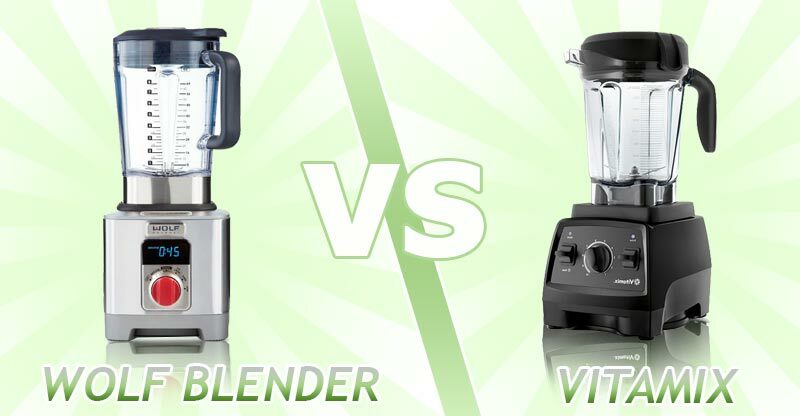 When considering Wolf blenders vs. Vitamix, compare how easy you can use each. Both machines are easy to clean and require no disassembling. The Vitamix cleans up in as little as one minute using warm water and dishwashing soap. Studies show preparing meals from whole foods helps save time and money over store-bought products. You can also reap substantial savings by eliminating the need to purchase some kitchen gadgets. The Wolf blender vs. Vitamix option lets you choose one blender that can perform a variety of kitchen functions all in one machine. There’s no need to purchase a separate food processor, mixer, grinder or mill. Either machine will also help save time by reducing some of the manual steps in food preparation like chopping, mincing or grinding. Less prep time means more interaction with friends and family. The Wolf blender vs. Vitamix study is also about longevity. You want a mixer that will stand up under pressure and give a consistently high performance. High-tech engineering, durable, sturdy stainless steel and cooling technology ensure consistent, high-quality, hygienic performance and results. The Wolf blender or Vitamix are two good brands with lots of uses and convenient features. You can make a wide range of food items including spreads, nut and seed butter, beverages, purees, shakes and smoothies, batters, and bread dough. With either purchase, you can help safeguard our fragile ecosystem. Using the Wolf blender or Vitamix can help reduce reliance on disposable, store-bought plastic containers. It also helps minimize the load in landfills that can take several years to disintegrate. For long-lasting performance and reliability, the Wolf blender has a guarantee of up to 5 years, and the Vitamix offers seven years full warranty. Either blender is a significant long-term investment. There will be no need to replace defective parts or change the equipment regularly. The Wolf blender offers a potent blend of power, performance, and consistency. There are a variety of speeds for blending specific food items. The 2.4 maximum HP motor propels the stainless steel blades to speeds of more than 20 mph. The highly sensitive LCD control panel keeps you updated on the blending process including speed, program settings and blending times. There are up to 4 convenient, pre-programmed settings that let you set your desired speed for even blending and mixing. The one-touch operation mode enables you to achieve fast, consistent results every time. The pulsing action is compatible with most standard blending speeds ranging from low to high. Using the Wolf blender helps take the guesswork and some of the manual labor out of food preparation. You can make quick, easy work of chopping, pureeing, grinding, whipping and emulsifying. The 64 ounces ultra-sized, the shatter-proof jar is also BPA free. The blender adds a professional touch to most kitchen tasks and is suitable for professional chefs and homeowners. The blender combines durable stainless steel blades and sturdy body that fits well under most standard cabinets. The secure, tight-fitting lid helps reduce spills when operating at high speeds. It comes with a tamper that fits into the cover to help break up thick, frozen liquids. The emulsion cup and filler cap include pre-set measurement marks for making even, consistent marinades, dressings, mayonnaise, and cocktails. The Wolf blender delivers consistently high performance in a range of kitchen functions. It blends batters for a quickbread, muffins, waffles, and pancakes and also has a separate smoothie setting. It also makes instant soup, chops vegetables, makes smoothies and shakes, purees, sauces, beverages and cocktails and crushes ice. The blender also grinds nuts and seeds to make butter and spreads. The Wolf blender is easy to set up and use and a breeze to clean up using the self-cleaning feature. It’s also easy to store and does not need a lot of space to operate. The blender does not wobble and remains stable while blending. Its robust, fast-acting functions help reduce prep time in the kitchen for consistent quality. The modern technology utilizes air-flow features that minimize noise when operating the blender. The built-in timer is compatible with pre-programmed manual models. The Vitamix blender is excellent for health-conscious individuals who prefer a more natural way of food preparation and eating. It comes with durable, aircraft-quality stainless steel blades for high-quality, performance on harsh textures. The 64-ounce cup capacity accommodates large food batches. The Vitamix has a variety of speed controls to help you adjust your settings according to various textures. You can also rotate the dial at any time during the blending process for more even blending as needed. There’s thermal protection and radial cooling system that ensures smooth, seamless operation. The blender is self-cleaning and can be ready to use in about I minute. Just add warm water and dish soap to wash away food particles and odors. There’s no need to disassemble the machine to clean it. It is easy to use, fits under most standard cabinets and delivers consistent performance with every use. The Vitamix blender comes with a full seven-year warranty. It delivers professional quality results from the comfort of your kitchen. The blender ranks in the top 20 best-selling Kitchen & Dining Countertop Blenders. Some machines can last for as much as 12 years. You can use the Vitamix to replace most functions of other food processors or gadgets. Use it to make quick work of butter, non-dairy milk, soups, spreads, purees, shakes, smoothies, drinks, and ice cream. It can also make sorbets, grind nuts, seeds and coffee beans and make frozen desserts, dressings, sauces, and purees. Also, the Vitamix is a handy tool for mixing bread and pizza dough and batter for cakes, muffins, waffles and pancakes and cookies. In addition to time in prepping foods, the Vitamix is a worthwhile, long-term investment. It replaces some other kitchen gadgets, saving you time and money. The Wolf blender helps you produce a variety of ready to eat treats for the household as well as social gatherings. You can whip up pleasing, professional looking cocktails and other delicacies to delight guests and family. The Vitamix converts whole fruits and vegetables into smooth, creamy shakes, smoothies and drinks. Adjustable high and low speeds give consistent quality. The Wolf blender is a multi-purpose kitchen machine that blends while foods smoothly and effortlessly. Four pre-programmed settings ensure precise, consistent, fast results. It’s convenient to use and clean up. The dual cap assembly and the emulsion cup allow you to add food items slowly when processing dressings, marinades or mayonnaise. The filler cup has pre-marked measurements for convenient use and consistent results. It also includes a tamper to help facilitate smooth blending of thick or frozen textures. The Vitamix can produce a variety of textures ranging from chunky to smooth. The pulse control action lets you create coarse chops when making salsas, purees or soups. You can create smooth or chunky sauces, soups, and dips without any additional manual preparation. It also brings nuts and seeds with comfortable to use, and conveniently adjustable dials. There is no wastage as the blender keeps all the fiber and nutrients in whole foods intact while processing. The Wolf blender has 2.4 peak performing motor propelling blades that generate over 210 motions. Dual settings ensure precise blending for smooth textures. The rotating force helps keep the temperatures cool and improves the machine’s ability to produce balanced, consistent power while processing. The Vitamix blender is a high-power motor with 2.2 HP propeller blades. It plows through tough food items for consistent blending. The engine also helps the machine maintain balance in force and regulates the temperatures. Wolf blender technology utilizes unique multi-colored brushed stainless steel control knobs. It comes with die-cast and stainless steel components. The Vitamix has a precise, laser-cut, stainless steel power mill designed with aircraft-grade, tough, stainless steel blades. The grain rests on a finished, highly polished, laser sharp metal. The blades are durable and ultra-strong and need no sharpening. It maintains consistent action throughout the life-span of the machine. The Vitamix can produce consistently smooth textures using a variety of whole foods, with no grits or chunks. It quickly and effortlessly purees and pulverizes entire food items. It breaks down and grinds hard to process nuts and seeds as well as tough vegetables like celery and broccoli. The blender is self-cleaning and needs no disassembling when cleaning. Overall, the Vitamix is a useful investment that helps reduce the need for multiple machines to perform various cooking and prep chores in the kitchen. Some customers shared the Vitamix may leave chunks after blending specific items like frozen tomatoes or plums. Some users had to use the tamper often to help keep them smooth. The Vitamix is not safe to clean in the dishwasher. Although the Teflon coating is FDA approved; some customers reveal the Teflon coating under the blade may flake off during blending. Customers find the Wolf blender to be versatile, highly functional and sturdy. It produces professional grade performance from your countertops. /the seamless process is easy to operate and control. The blender is versatile and replaces a few other kitchen gadgets, saving you time and money. It’s suitable for processing a variety of textures from coffee beans to nuts and seeds and makes quick work of smoothies, shakes, and soups. There are no current negative reviews of the Wolf blender. When you are purchasing a Wolf blender versus Vitamix, your choice will depend on personal preference and specific needs. Both blenders offer value for money, consistent high results, and excellent versatility. They are user-friendly and can replace quite a few other kitchen gadgets all in one machine. This review will be a question of how often you plan to use the machine and the long-term benefits you gain from consistent use. Each mixer offers unique benefits while utilizing similar processes and technologies. What’s essential, both blenders will help save you time and money and improve the nutritional value of natural foods. The pre-programmed settings and controls help you save time, and entertain friends and family with professional quality food and drinks. 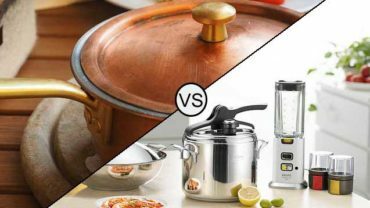 Copper Cookware Vs Stainless Steel Which One’s The Best?